I've now reviewed four of James Kaiser's "Complete Guide" books, Acadia, Yosemite, Grand Canyon and this one. I can tell you a compelling reason that you ought to purchase this third edition of Joshua Tree: The Complete Guide. I don't know of any other guide book gives you so many stunning color photographs for $20. The author has captured so many gorgeous images that I love to pick up his books periodically and take a five-minute virtual adventure. The fact that Kaiser also provides detailed maps, hiking guides, historical background and tips for visiting Joshua Tree National Park is all "gravy" on top of these wonderful photographs. Joshua Tree, like Kaiser's other guides, is organized into six primary sections. The first part provides an excellent overview of the park, a list of campgrounds, a brief discussion about the surrounding towns, the historical background of the area, and great descriptions of the flora and fauna of the area. (Wait until you see the photograph of the western diamondback rattlesnake! You've got to wonder where the camera was for that shot!) The second section holds the meat of the guidebook, detailed visitor information for twenty places in the park. I've been to a few of them over the years, but most were new to me. One place I will certainly explore after reading this book is the Geology Tour Road south of Queen Valley. The promise of spring wild flowers, prehistoric Indian camps, abandoned gold miles and interesting geology is very intriguing. The last section of the book deals with the Sonora desert region of the park, another area I've never visited. 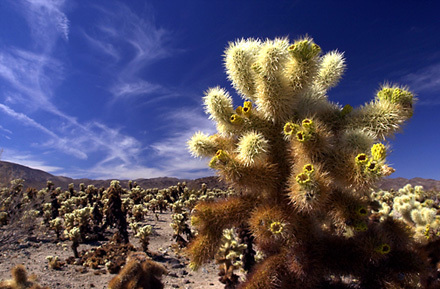 One of the attractions in this part of the park is the Cholla Cactus Garden nature trail. 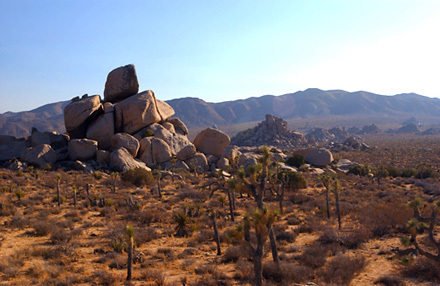 What draws most return visitors is the chance to scramble among the amazing boulders deposited over the millennia. This is a rock climber's haven during the winter months when other climbing areas like Yosemite are covered in snow. 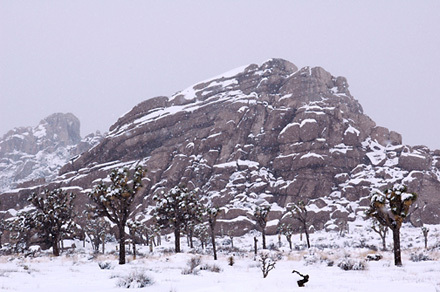 It can snow in Joshua Tree, of course, but it's a relatively rare event. 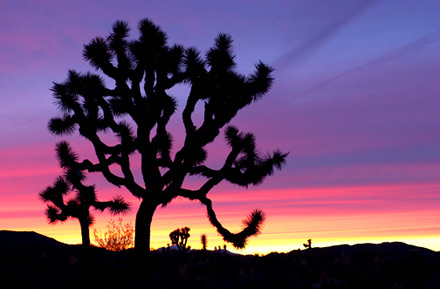 What's not rare are stunning silhouettes of Joshua trees at sunset and awesome night skies full of more stars than city dwellers can imagine. The photographs in this book make it an outstanding armchair experience. Kaiser's prose and insider tips make it a must-have for anyone heading to Joshua Tree National Park.